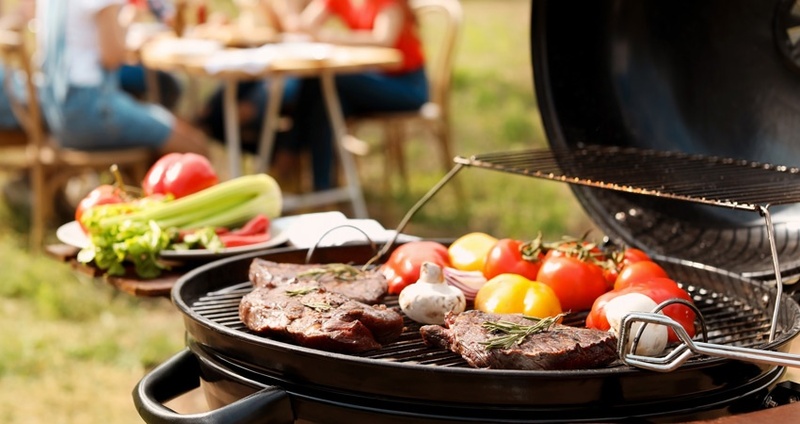 Summer cookouts can be one of the hardest eating events to navigate since they tend to go on for several hours. Rather than having 3 things to choose from you have a smorgasbord of foods and beverages making it easy to overindulge. The idea of wanting to sample small bites of everything can quickly add up and once alcohol is involved, forget it! Here are a few simple tips that will allow you to indulge a bit without the guilt. Eat Before You Go: Sampling new dishes prepared by someone other than ourselves is part of the fun at a cookout. You can still sample the things you want to try, but don’t skip meals leading up to the event. Starting your day with your usual breakfast, and either a snack or lunch before you go will make you less ravenous or likely to go off the deep end with your food choices and portion control. Fill Up on Quality: Fill your plate with grilled vegetables, fruits and lean protein to start. This will allow you to get full on higher quality foods first and then you can always go back later if you are still hungry or want to sample something a bit more indulgent. Move Away From the Table: We tend to hold most of our conversations around where food is placed. Rather than grazing the entire time and feeling as though we never fully ate, make a plate of food and then move the conversation to another area where you’ll be less prone to keep going back for more. Pick Your Pleasure: Decide whether you want to have alcohol or sweets, but not both. Alcoholic beverages can seem really refreshing on hot days, but the calories can quickly add up. If you choose to drink, pick light beers, wines, and spirits and avoid beverages mixed with juices and simple syrups. Make a mental note of how many drinks you want to have before starting and stick with it. If sweets are your pleasure the same rules apply. With both alcohol and sweets try and consume protein around the same time so you avoid spiking your blood sugar making you want to go back for more. Ditch the Chips: Be choosy with what you are going to have. Nibbling on pretzels, potato chips or crackers isn’t all that exciting, plus the salt can make you feel bloated and retain fluid. Why not save your calories for something better? Choose foods you don’t usually get to have and if you go for something that is more carbohydrate centric just try and balance it with protein. Hydrate: Being in the sun or long exposure to heat can easily zap our energy making us reach for salty foods and drinks to perk us up. Make sure to stay hydrated especially if consuming alcohol and reach for food (fruits and veggies) and beverages that will help you hydrated throughout the day. Bring It: If you know you want to be a bit more indulgent but don’t want to completely blow it, make the dish yourself and find a way to lighten it up. Here we’ve given you some ideas on things you can bring if you are attending or make if you are hosting that are light on calories and balanced in protein, fat and carbs but not on taste. Here are a few delicious Zone approved recipe ideas which you may find helpful when planning your menu. If you need more, please check out our recipes at www.zonediet.com. If not using an unstrained yogurt, strain it using a strainer lined with a coffee filter for a few hours to remove as much liquid as possible. Set aside. Quarter the cucumber and cut off all the seeds. Grate the cucumber and sprinkle with salt. Let sit for around 20 minutes. Give it a squeeze in paper towels to help release excess liquid. Stir all ingredients into a bowl to combine. Refrigerate for a couple of hours before serving. Prepare Zone PastaRx Fusilli according to package directions. Drain and rinse in cold water to stop cooking. Set aside. Hard boil 4 eggs. Set aside, whites to be added to salad at the end. In a large bowl make sauce by whisking together 0%-fat Greek Yogurt, extra virgin olive oil, fresh-squeezed lemon juice, vinegar, dijon mustard, pickle relish, dill, garlic powder, oregano, salt and pepper. Add in the prepared vegetables (red bell pepper to onion) and then gently toss in Zone PastaRx Fusilli, egg whites and olives until well-combined; cover and refrigerate until ready to serve. Prepare Zone PastaRx Orzo according to package directions. Reserve 1/2 cup of liquid an drain. Set both aside to cool. In a small bowl, make your dressing. Whisk the lemon juice, reserved pasta water, olive oil, garlic powder, salt and pepper. Pour onto the salad and toss to coat. In a large bowl, combine the thawed, squeezed spinach, tomatoes, cucumbers, black olives and cooled Zone PastaRx Orzo. Pour dressing onto the salad and toss to coat. Add more reserved pasta water if desired, and season to taste. Mix ground turkey and one-quarter of the onion and bell pepper. Divide the mixture and form into 2 patties. Grill the patties until cooked. In a pan add olive oil and sauté the remaining bell pepper, onion and mushrooms. In each “wrap” spread 1/2 cup spinach and add half of the cheese slice. Divide the sautéed vegetables and the broken up burger (chop each burger into a few pieces). Drizzle 2 tablespoons dressing in each wrap. Marinate chicken in 2 tablespoons of soy sauce for at least 15 minutes. Whisk remaining tablespoon of soy sauce with chili sauce, red pepper flakes, peanut butter, sesame oil and parsley until smooth. Set aside. Thread chicken, bell peppers and onions onto skewers. Place skewers on a lightly greased, rimmed baking sheet. Broil on top rack with the tomatoes for 3 to 4 minutes per side or until cooked through. Serve satays on a platter over broccoli with tomatoes around the edge and the reserved sauce for dipping on the side. Have a bowl of strawberries.